Gerald Weber of Kendrick Amplifiers granted us permisssion to use this video, which features a Blooper Reel out−take from his 2005 DVD release, Tube Guitar Amplifier Servicing and Overhaul. I spliced together a still image with an out−take from the DVD, and then added the rolling credits at the end of the piece. Gerald Weber of Kendrick Amplifiers also granted us permisssion to use this PDF file, which features a dual attenuator. This file cannot be printed, but you will be able to download a full printing version from Kendrick-Amplifiers.com soon! This file demonstrates the ability to embed audio, video, hyperlinks (both visibile and invisible! Mouse around the document to see what you can find...) and document specific links among many other document options that are cross-platform compatible. 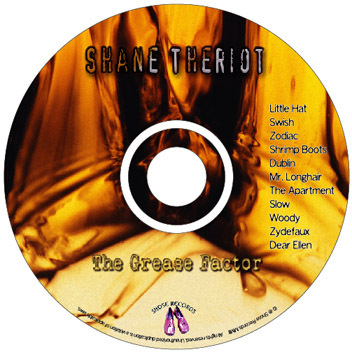 I created this CD print solution for Shane Theriot's second CD, The Grease Factor. I created this CD print solution for Shane Theriot's first EP, Dirty Fingers. 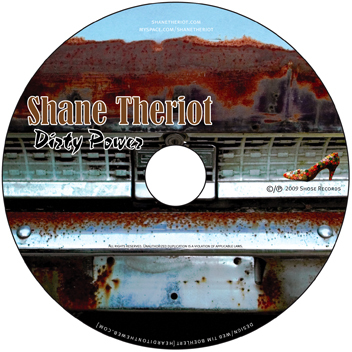 I created this CD print solution for Shane Theriot's third CD, Dirty Power.